Hello Dealsnloot Readers,Free Dominos Rs 150 Voucher Hi Looters There I Have Come up with Big Dominos Voucher Loot For You Get Rs 150 Voucher Free In Every Mobile Number. 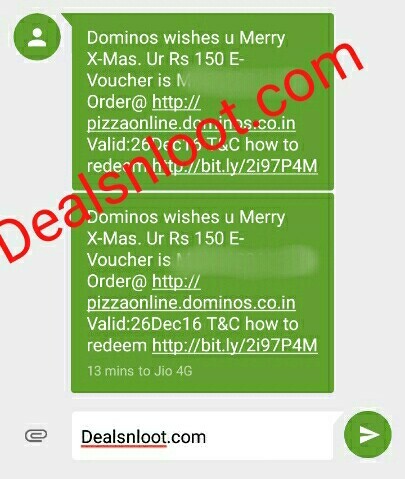 Dominos Spin & Win contest bringing joy for all dominos lovers. 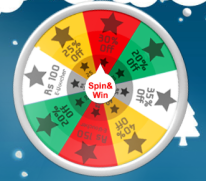 By spinning dominos Christmas gift wheel we can grab free gift vouchers worth rs 150 and rs 100.So Hurry !!! Grab This Gift Cards Using Our Hack tricks. Click On Open On Incognito Mode. Only applicable online. Click on pizzaonline.dominos.co.in EGV is a mode of payment and is used at the time of payment only under Egift voucher. No refund will be given by the restaurant manager. In case the amt. of bill is less than the e-voucher amt.No offers can be applied in case payment is done through E codes. The balance amount after using E voucher code can only be paid by Cash. Only 1 E. voucher can be used per order.E.vouchers are electronic codes, therefore physical collection of the voucher is not required.30 mins. Or Free is not applicable in case of order through EGV, although restaurant will follow all possible means to ensure delivery within 30 mins.